I’ve told you several times about my intense love of cookies. While chocolate chip cookies are probably my favorite, I enjoy them all. For my husband it’s a bit harder for him to choose a favorite. 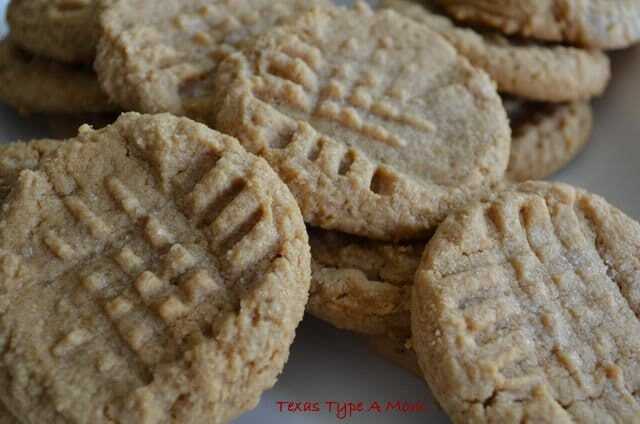 Peanut butter cookies remind him of his childhood and nostalgia can definitely make things taste even better. The ingredients to make chocolate chip cookies may not always be in my pantry, but I can always make peanut butter cookies. I’ve been using this recipe since I was a teenager and it’s just so easy and equally as delicious as a recipe with a ton of ingredients. Try this peanut butter cookie recipe that uses only three ingredients for yourself and you’ll be a believer. 3. Drop by rounded spoon (or cookie scoop) onto ungreased cookie sheet. 4. Use a fork to press down the top of the cookie in opposite directions. 5. Optional: sprinkle additional sugar on top. 6. Bake 8-10 minutes in preheated oven. Be careful not to overcook – they make look soft still but will set up as they cool. If you’re looking for more cookie recipes, check out my Easy Snickerdoodle Cookies recipe! I made these before! Only instead of peanut butter, I used almond butter because of a peanut allergy in the family. So very tasty AND super easy! I remember years ago when you told me about this recipe! It’s turned into my favorite. I like to make it with extra crunchy peanut butter. I make these for Scot to take with him as a snack when he leaves for longer business trips. I can’t believe how easy this is. Never would have thought it! YUMMY! These look incredible! So yummy! Thanks for the recipe, I’m going to try it out. Proceed as above, except use crushed nuts or oatmeal for topping. I can’t believe this is possible! Like, I have all these ingredients on hand and I could be eating cookies in 15 minutes. This is awesome! We love these too. My sister use to make them in her dorm room when she was in college. I can’t believe it’s only a 3 ingredient recipe. That’s awesome! How simple. My husband loves pb cookies.